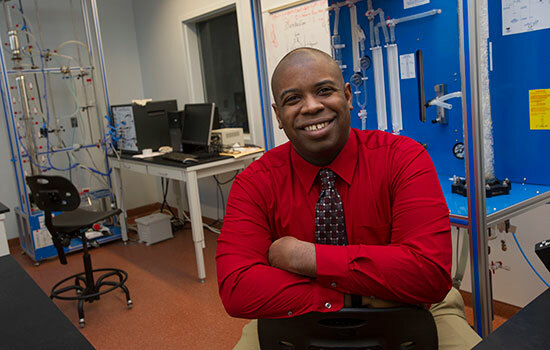 Reginald Rogers, assistant professor of chemical engineering, has been awarded the Dr. Janice A. Lumpkin Educator of the Year award by the National Society of Black Engineers. Reginald Rogers, a faculty member at Rochester Institute of Technology, has been awarded the Dr. Janice A. Lumpkin Educator of the Year award by the National Society of Black Engineers (NSBE). The award is given annually to a collegiate faculty member who has demonstrated commitment to advancing education in engineering, science or mathematics. The assistant professor of chemical engineering in RIT’s Kate Gleason College of Engineering is being recognized for academic and research achievements and for mentoring students as adviser to the campus’ student chapter of the NSBE. Rogers will receive the award at the society’s upcoming conference and annual convention taking place March 24 in Pittsburgh. Named after the late Janice Lumpkin, a professor of chemical and biomedical engineering at the University of Maryland Baltimore County, the award is given to a faculty member at an institution of higher education that embodies her dedication to research, teaching and service, as well as her inspiration as a role model to African-American scholars. In 2016, Rogers was the recipient of the Richard and Virginia Eisenhart Provost’s Award for Excellence in Teaching, one of RIT’s most prestigious teaching awards for faculty who have taught three years or less. Rogers has expertise in lithium ion and sodium ion battery systems and adsorption using carbon nanotubes for environmental applications and chemical/biological sensors. His work has been published in multiple peer-reviewed journals and as part of text books about lithium ion battery technologies. Of his many awards, Rogers was named Partner of the Year by RIT’s Multicultural Center for Academic Success for his work both in and out of the classroom mentoring undergraduate students in STEM programs.